I baked and cooked a lot before I started blogging. So, I’ll be using Thursdays (aka TBT or Throwback Thursday) and Fridays (aka Flashback Friday or FBF) to share some of my favorite baking and cooking projects from the past. It’s hard to find affordable jams at the grocery store that don’t have a lot of preservatives, fillers, and high fructose corn syrup. So I took matters in my own hands and made strawberry jam with only three ingredients- fresh strawberries, sugar, and lemon juice. 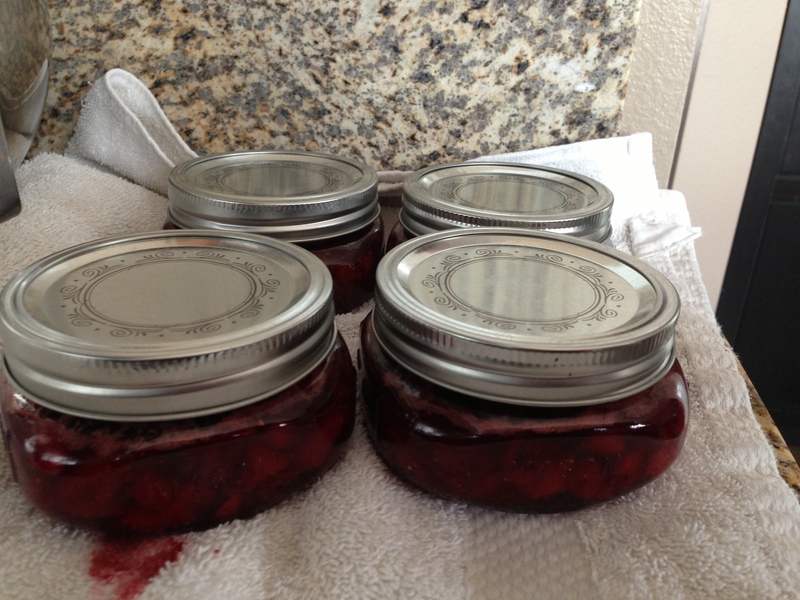 While it does take some time to prep the jars for canning, the actual process for cooking the jam is really straight forward, and the steps are simple (This was the first time I had canned anything). Plus, this jam is so delicious that it makes me never want to buy jam from the grocery store again. It tastes like jam should taste – sweet and fruity and nuthin’ else. 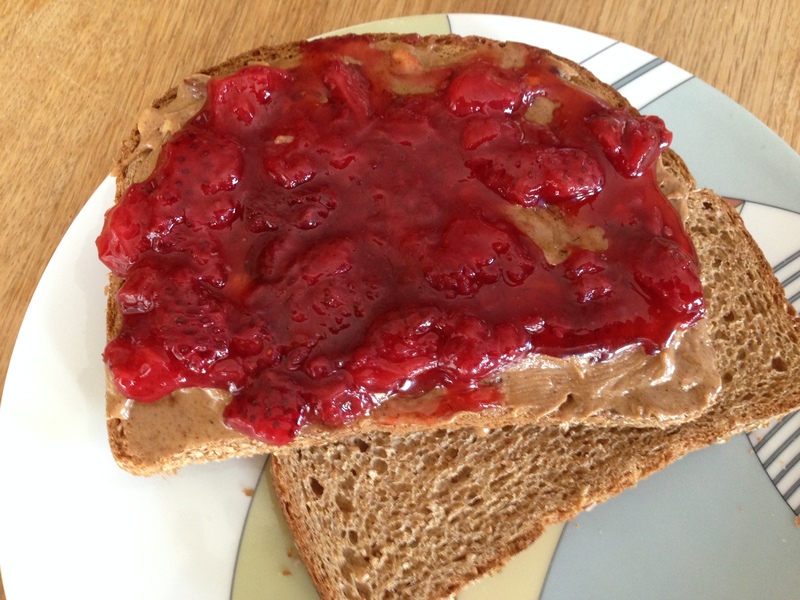 The basic peanut or almond butter sandwich becomes so much more luxurious when it’s made with homemade strawberry jam. NOTE: It’s useful to prep your ingredients and lay out your equipment, bowls, and colander ahead of time. It’s also helpful to have some basic canning tools like a jar funnel (placed in the mouth of a jar to fill the jar without spilling), a jar lifter (helps safely lift jars out of hot water while canning), a lid lifter (lifts lids out of hot water using a magnetic end), and a ladle (used for for transferring the jam into jars). I’ve included a list of equipment I use for jam making at the end of this post. Sterilize the jars (Wash jars and submerge them in a large pot of water. Heat the water to a full boil, making sure the water covering the jars has been at a full boil for at least 10 minutes to ensure proper sterilization). Keep the jars hot in the canning pot. Put a small plate in the freezer. This will be used to test whether the jam has been cooked long enough. Put the flat lids in a heat-proof bowl. Put the strawberries and sugar in a wide, 6-8 qt preserving pan or a large flat saucepan. Bring the berries and sugar to a simmer, stirring frequently, and continue to cook for 5 minutes. Pour the berry mixture into a colander set over a large bowl, and stir the berries gently to drain off the juice. Transfer the berries to a bowl and set aside. Return the berry juice to the pan and bring to a boil over high heat. Boil, stirring occasionally, until the syrup is reduced to about 1 1/2 cups. This can take between 10 to 20 minutes. Use a large spoon to skim foam from the syrup as needed. Return the strawberries and any accumulated juice to the pan, along with the lemon juice and the zest (if using), and bring to a simmer. Simmer the jam, stirring frequently, until a small dab of the jam spooned onto the chilled plate and returned to the freezer for a minute becomes somewhat firm (it will not gel), about 10 to 15 minutes. Skim off as much foam as you can, then remove from the jam from the heat, and stir gently for a few seconds to distribute the fruit in the liquid. Ladle boiling water from the canning pot into the bowl with the lids. Set aside and let the rubber on jar lids soften. Using a jar lifter, remove the sterilized jars from the canning pot, carefully pouring the water from each jar back into the pot. Place the jars upright on a folded towel. Drain the water off the jar lids, then put a flat lid and ring on each jar, adjusting the ring so that it’s just finger-tight. Return the filled jars to the hot water in the canning pot, making sure the water covers the jars by at least 1 inch. Bring to a boil, and boil for 5 minutes to process. Place the jars on a folded towel, and do not disturb for 12 hours. After 1 hour, check to see if the jars have been vacuum sealed. This is often indicated by the lid “popping”. You can also test to see if the lids have sealed by pressing down on the center of each lid. If the center of the lid can be pushed down, it has NOT sealed properly, and the jar should be refrigerated immediately. If the jar lid is indented downward, then the jar has sealed properly. Label the sealed jars, and store in a cool, dark area for several months.. 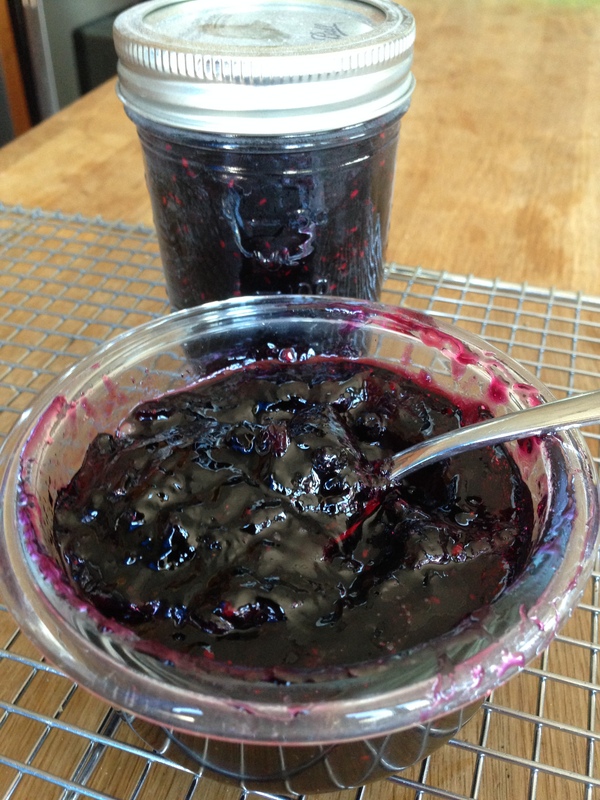 The following is a list of equipment and tools I use for making jam.